UML profile diagram is a structure diagram which describes UML extension mechanism by defining custom stereotypes, tagged values and constraints. domains, such business process modeling, service-oriented architecture, medical applications, etc. For example, semantics of standard UML metamodel elements could be specialized in a profile. In a model with the profile "Java model," generalization of classes should be able to be restricted to single inheritance without having to explicitly assign a stereotype «Java class» to each and every class instance. The profiles mechanism is not a first-class extension mechanism. It does not allow to modify existing metamodels or to create a new metamodel as MOF does. Profile only allows adaptation or customization of an existing metamodel with constructs that are specific to a particular domain, platform, or method. It is not possible to take away any of the constraints that apply to a metamodel, but it is possible to add new constraints that are specific to the profile. Metamodel customizations are defined in a profile, which is then applied to a package. Stereotypes are specific metaclasses, tagged values are standard metaattributes, and profiles are specific kinds of packages. Profiles can be dynamically applied to or retracted from a model. They can also be dynamically combined so that several profiles will be applied at the same time on the same model. Graphical nodes and edges used on profile diagrams are: profile, metaclass, stereotype, extension, reference, profile application. 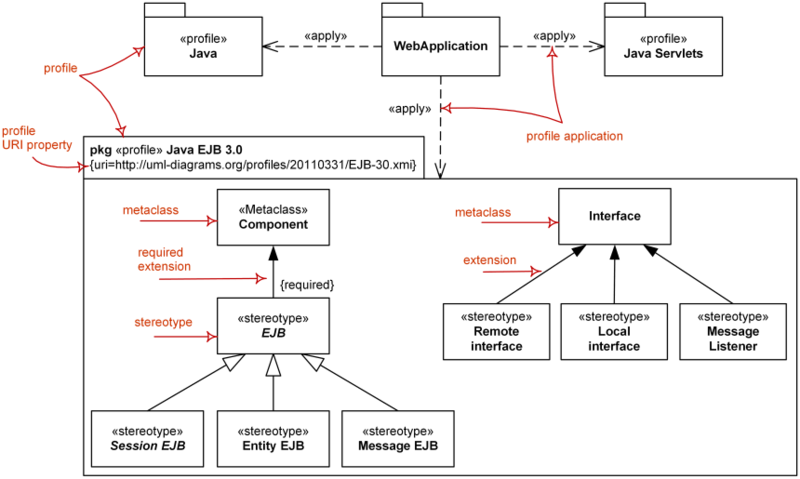 Major elements of UML profile diagram - profile, stereotype, metaclass, extension, profile application. Profiles were present in UML 1.x. Profile diagrams were introduced in UML 2.0 but first appeared on "official" taxonomy of UML diagrams in UML 2.2 ([UML 2.2 - Superstructure], Figure A.5).